You can dress up this dish by adding a few dried figs, if you like. Trim off the stems and, depending on their size, halve or quarter them. Soak the figs in the sherry for 10 minutes and then drain them, reserving the sherry. Add the sherry as directed and add the figs to the sauce along with the broth. Heat the oven to 425 degrees F. Rinse the duck breasts and pat dry. Trim any silverskin from the meat side of the breasts. Scrape the tendon out of the tender, if it's still attached, and pat the tender back in place. Trim the edges of the skin so there's about 1/4 inch overhang. With a sharp chef's or boning knife, score the skin in a 1/2-inch crosshatch pattern. Try to cut only through the skin and not into the meat. Season the breasts on both sides with salt and pepper. Heat a large ovenproof saute pan or skillet (don't use nonstick) over medium-high heat for 1 minute. Put the duck in the pan, skin side down, and let it sear. As fat collects in the pan, spoon it off once or twice. When the skin turns medium brown, after about 6 minutes, reduce the heat to medium. Continue to cook until much of the fat is rendered from the duck and the skin looks crisp and deep golden brown, another 2 to 4 minutes. Flip the breasts skin side up, spoon off any remaining fat, and put the pan in the oven. Roast until the duck is cooked to your liking: 3 to 4 minutes for medium rare and 5 to 6 minutes for medium well. To check for doneness, cut into a breast or use an instant-read thermometer: 135 degrees F for medium rare, 155 degrees F for medium well. Transfer the duck to a plate or platter and tent with foil to keep warm. Set the pan on medium-high heat and pour in the sherry and sherry vinegar. Immediately scrape the pan with a wooden spoon to release any cooked-on bits. Boil until the liquid has reduced to about 2 tablespoons, about 3 minutes. Add the broth, honey, thyme, and 1/4 teaspoon salt. Boil until the liquid is reduced by about half, about 3 minutes. Reduce the heat to low and blend the butter into the sauce by consistantly stirring or swirling the pan. 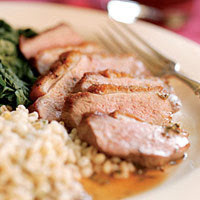 Slice the duck thinly on an angle, arrange it on heated plates, and spoon the sauce over or around it. Serve right away. This entry was posted on 3:40 AM and is filed under Duck and Goose . You can follow any responses to this entry through the RSS 2.0 feed. You can leave a response, or trackback from your own site.